So for this week’s edition I thought I’d share a fishing trip with ya. You can understand it’s not that frequent that we get to go “fun fishing” as guides and even less common to get out after American red snapper. My Pathfinder 24TRS is an amazing fishing platform and can hold her own in a heavy chop and rough swells. Those seas are not what I’d call normal operation but it’s nice to know she can take “less than optimal” conditions. Needless to say, there are lots of stars that need to align to allow one to get out to (and more importantly back from) the 100-150 foot range needed to target ARS. A good practice when you don’t normally make those long runs is to file a float plan with someone you trust with departure and arrival times and an approximate position you plan to visit on your trip. That’s just the minimum. It’s better to have one of the emergency positioning beacons like an Emergency Position Indicator Radio Beacon (EPIRB) or a Personal Locator Beacons (PLBs). These devices are small radio transmitters, connected to a global government-run emergency network, which is used worldwide to alert Search and Rescue agencies in the event of a dire emergency. A cheaper alternative is a device similar to the SPOT Satellite GPS Messenger unit which works like a sat phone text messenger. I think you get the point about being a safe and prepared captain of your vessel. Kelly and I set plans and waited for a clear shot to run out 50 miles. Finally, all stars aligned and last weekend we were able to make our first ARS run. We grabbed my son and my buddy Mike, loaded the coolers with ice and put some distance between us and the sunrise. Somewhere around 8 AM I backed off the throttle and settled down enough to look at the bottom… more importantly look for fish. Our first 10 min produced a school of small mahi mahi. If you encounter these guys, it’s important once you get one hooked to keep a hooked fish in the water at all times and swimming around the stern on a short leash. The others will hang around long enough to boat a few more before they move on. They were a lot of fun but remember… I was looking for snapper so we put a few in the box and moved on. After a few stops, we finally find a good wad of fish and a few drops produced some really nice red grouper. “That’s getting closer, but still not red snapper,” I tell my buddy Mike. Onward my friend…Our next stop yielded a few more red grouper and a really nice scamp that measured a whopping 28 inches! “Still not red snapper Mike,” moving on! So now Kelly is at the helm for a bit and a few spots later she puts us on red gold! I drop down first and before it gets to the bottom I’m on! Oh yeah! I think to myself “This feels like a snapper!” Sure enough I soon see that red and white beauty I’d been dreaming about for so long. 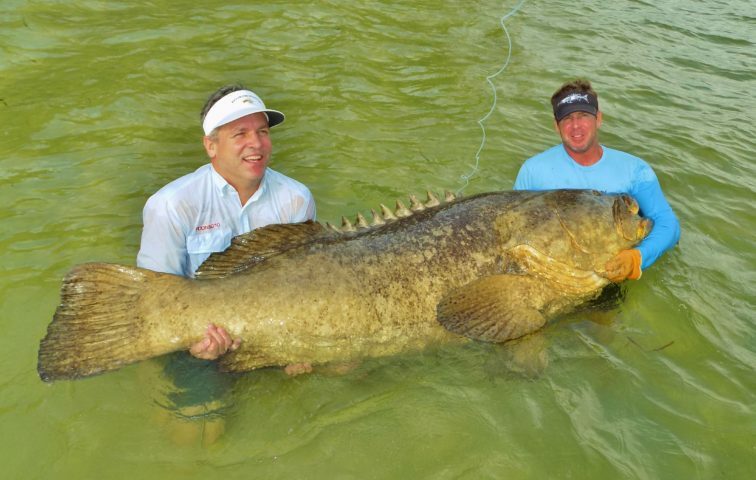 I quickly flip it in the boat and check the size on the ruler and 15 inches… dangit! It’s too short, back to the blue with you my friend. By now everyone is bowed up with fish and quickly have enough to fill our limit of two per angler. I got to say that was a fun trip and glad everything worked out as planned. We got a few snapper over 22 inches and a few of our red grouper topped out at 30 inches. So needless to say we pointed the bow of my pathfinder towards home before the afternoon storms hit. 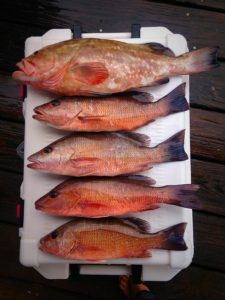 With red snapper season ending soon, you have limited time to get out and box a few reds for your dinner table. It will be well worth the effort and time invested! Our best red snapper bite was in about 140ft of water. When searching for fish, look for a mass of red on your bottom machine. At times, we were marking a solid 30ft of fish. The lighter blues and yellow indicate more of baitfish and lane or vermillion snapper. Don’t waste too much time on that spot but check around that area for the red mass as mentioned. Once we found the school, we dropped live pinfish on conventional gear with 5-6oz of lead with a traditional bottom rig. My conventional gear is spooled with 50lb mono with a 50lb flouro leader. We also did well using cut mullet on a 1oz jig head on Spinfisher 6500 spinning tackle. Folks, that’s gonna do it for me this week. Bookings for our fall season are already filling up and if you want to get your FIX on… give me a call @ 941- 698- 03 23 or… find us on Facebook, Instagram, You tube or our web page @ www.floridainshorextream.com. Boy it’s hot out there this time of year! For the most part of this year we’ve been dealing with week after week of battling high winds and water clouded with runoff from the daily bombardment of precipitation. Normally we have clearer waters on which to fish but as of late we’ve had to settle for stained, grass filled flats. 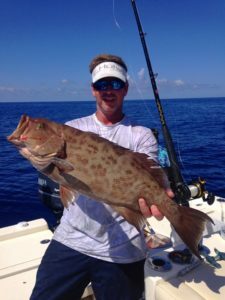 The offshore grouper bite has been awesome for reds, as well as gags. You may have to push out a bit further to find some cleaner water and bigger fish, but it’s well worth the extra fuel you might burn. On the other hand, mangrove snapper and lane snapper remain on the prowl and are very abundant on most of our locally published reefs and hard bottom. Snapper have very keen eyesight so if you are after these tasty adversaries you’ll need to downsize not only hook size but your line as well. Which, sadly to say…has a very small margin for error. It’s a balance between getting bit or getting broke. I run an 8 foot Penn 6500 Spinfisher V for my spinning outfit spooled with 15-40 lb braid and for my conventional set I use a Penn Fathom 40 spooled with 50 lb mono. For the snapper, I use a light wire 2/0 or 3/0 circle hook and a minimum 3 ft of 20-25 lb fluorocarbon leader. Now here’s where a lot of tactics will differ with bottom rigs and I could go on for a while with them. But I think for all around simplicity the old school bottom style rig is the best all-around rig. But they basically all have the same common denominator…to keep the bait a good distance from the weight and more importantly… the ability of the bait to move freely. Snapper are a bit cunning and will rob you blind if you’re not playing an active role. 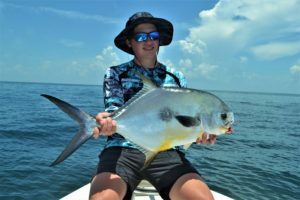 Because of their keen eyesight, the best times to catch these guys are to be anchored on your favorite reef or “secret spot” using several bags of chum to get them fired up and then free line a 1-2 inch chunk of cigar minnow or threadfin down in that chum slick. There are lots of factors involved with getting this technique dialed in but once you do… its money! 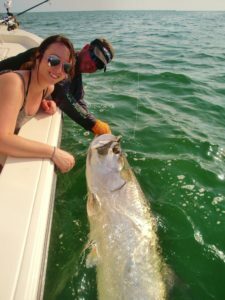 The beaches are still loaded with tons of fish…not only snook, but lots of fun fish like jacks, ladyfish, spanish and king mackerel. Also the pods of bait are just above small fry baits… so like I always say match that hatch and down size your bait choice to something close to what they’re eating. Watch for glass minnow schools because the jacks, lady fish and trout are gonna be close by. Try using lures with some weight to get more range… range translates into more time with baits in the water, which in turn… will get you more action. If you’re ready to get out and see how Kelly and I do it, give us a jingle at 941-698-0323. You may also find us on Facebook, Instagram or our web page Florida Inshore Xtream. Well folks, you know the deal…gotta get on out and get my FIX on! So … tight lines and y’all stay safe!! 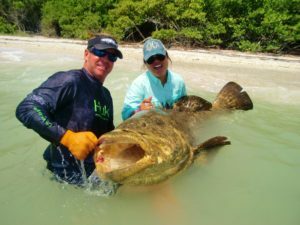 Boca Grande is heating up…temperature and fishing! Hot and humid. That’s something you’ll be hearing over the next few months. So I’d recommend fishing the offshore waters and escape the inshore heat. I’ve been seeing the water temps in the low 90’s. Offshore fishing is really heating up as the heat index is reaching 100 degrees. Remember to bring plenty of water with you as you’ll sweat… a lot. Look for birds diving on bait pods. There are lots of Spanish mackerel and bonito crashing bait. Getting small jigs like pompano jigs, spoons or soft plastics in the action is a good way to get some fast action… and that’s how you’ve got to retrieve it as well, fast! Barracuda tube lures are a blast if you’ve lost a few fish or lures to the “blade of the deep”. Be very cautious with these power hitters as I’ve seen them launch 10ft out of the water! The snapper and grouper bite has been pretty good. For best luck, go to your “secret” numbers…those that everybody and their brother doesn’t know about. If you don’t have any of these, visit the artificial reefs out past 10 miles and toss in a chum bag. The snapper have been responding well and we’ve been catching them by freelining a piece of cut bait on a 3/0 circle hook with 30lb flourcarbon leader. For keeper size grouper, we’ve been dropping live squirrelfish and pinfish on a traditional bottom rig. 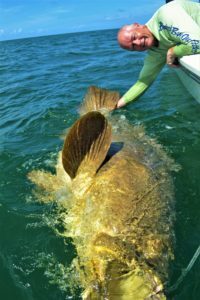 The goliath grouper bite around Boca Grande has been hot. As of July 29, we have caught and released 186 goliath grouper. We just recently teamed up with FWC biologists and began collecting fin clips from each goliath grouper we catch. This data, along with other acoustic data, will allow researchers to compile a large genetic base and eventually be able to determine clans, movements patterns, and much more. We have swayed away from fishing inshore this summer because of the heat and the better fishing available in our nearshore waters. However, the inshore fishing has still been pretty good during the few trips we fished around Bull and Turtle bays. 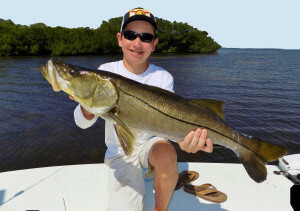 There are a lot of snook to catch. Look around the areas with significant water flow. We have a lot of little bait in the area and it is being funneled in and out of these areas holding snook. Easy catch! Freeline a white bait or threadie on a circle hook with the current and let the bait swim as naturally as possible. The redfish fishing has been less than in years past but they are still there to catch. There are some good numbers of reds in Bull Bay. We have been having the best luck with cut pinfish and ladyfish. The “fun fish” bite has been great. The flats around Devilfish have a lot of spanish mackerel, bluefish, trout, and jacks when the current is flowing right. A poppercork or jig with a soft plastic is the best bet. If you’d like to get out on the waters of Charlotte Harbor and Boca Grande, give us a call and we can set you up for a fun filled day of fishing. 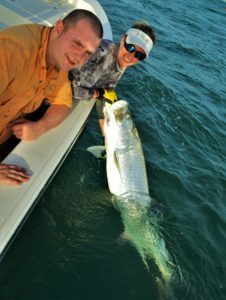 Boca Grande tarpon fishing is in full force. Wheeeeeeeeeee… the tarpon bite has begun!! Like I’ve said before when you are looking to target these elite battle hardened veterans you’ve really got to have your stuff together and trying to skimp on your gear is a very poor choice. You need good quality gear to even think about fishing for tarpon. Now there are many different manufacturers to choose from when selecting a set up for tarpon. I won’t sit here and tell you that this reel and that reel is the best and those reels are garbage. What I will tell you is what I’ve personally tried and tested and what will work for you. My set up is Penn Spinfisher V 6500 and I’ve mounted that bullet proof reel to an 8’ Penn Battalion fast action rod with 20-40 pound line rated capacity. I also have spooled that spinfisher with 40 pound power pro. These are a great starting point for you and remember when using braided lines, fluorocarbon is a must! I would suggest starting with 50 lb fluorocarbon and work up or down from there. Next I’ll use a good quality 3 or 4x circle hook and I’ll attach that with a loop knot. Now for a bit of tarpon fishing etiquette… and this is something you really should heed. One of the biggest mistakes you can make is to run up on some fellow anglers with your outboard. This will get you scuffed up quick. When making an approach on a pod of fish or other anglers working a pod. You want to stop well outside of where they are fishing somewhere around 200 yards would be a safe bet. Kill that 2 stroke and drop the trolling motor in and make you way over. Now you’re not ready to start sling that bait just yet. Try to get a “feel for what the pecking order is by loitering just outside of casting distance. This is your opportunity to observe what’s going on and what direction the fish are traveling. Try to position your boat so the fish will come to you. This way you are waiting your turn and not running over someone else’s fish. By doing this you’re asking permission and shown the other anglers a little courtesy and not just plowed in and push the fish away. After that you’re in the rotation and can work the fish as well. Trout bite has been very reliable and a popping cork and a live shrimp prove a deadly combination. Hopefully with the warmer weather and the water temps creeping back up into the 70’s we’ll see better bait showing and more of our game fish species become more active. Topwater action is picking up for these aggressive little buggers as well. We have had some pretty good action slinging plastic in the past week. This type of fishing is absolutely amazing and probably my favorite bait to throw. But you’ve got to get the right motion or you’ll be wasting time. Walking the dog action envolves a zig-zag constant movement of left right left right hard enough to activate the rattles but soft enough to keep the bait in the water. It might take a bit of practice to get it just right but well worth it when it’s done properly. If you can get out to some of the nearshore reefs … they’re covered up with some really great fish as well. I’ve been hooked up with good numbers of permit on the nearshore reefs and they love crabs!! Now I will tell you the bite has been a little on the slow side with these poor mid­-day tides lately. That should be changing later this week with the new moon. If you’re looking for trout, places with grass flats like pine island sound, east and west wall, are loaded with trout. Look for large bait schools with birds diving on them up on the grass flats and moving water. Start shallow and work your way out into deeper water 5-6 ft.
Reds are chewing when you can find them and we’ve managed to boat some very nice fish this week. We should have a good bite starting back up with the better tides…bigger tides are making better water in the flats in the afternoon. The better bite for the past few days has been first light and a few hrs before dark. It’s sometime best to run out and fish until 10ish then go get some lunch, run some errands and then come back out for the evening bite. 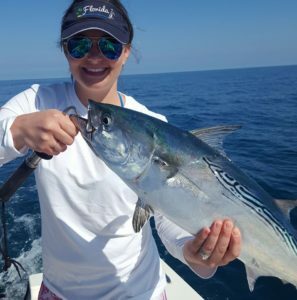 So happy fishing from us here at Florida Inshore Xtream charters and remember if you’re ready to get out and see how we do it you can call us at 941- 698- 0323. Find us on Facebook, Instagram or our web page www.FloridaInshoreXtream.com. Well folks, you know the deal…gotta get on out and get my FIX on! So … tight lines and y’all stay safe!! Oh yeah… one last thing… keep your eyes open for sharks. They love to eat tarpon and they are out there!